Arosi is an Austronesian language spoken by about 7000 people on the northwest end of Makira, an island in the Solomon Islands. Makira was known previously as San Cristobal or San Cristoval, and until the 1880s, was called Bauro by the Melanesian Mission. David Griffiths, in his Bibliography of the Book of Common Prayer, lists Arosi and Bauro as two of five dialects of the San Cristoval language, while Ethnologue has five different languages (including Arosi, Bauro, and Owa) spoken on this island. Na Collect Rago Mana Tarainei Rine Haarahesi Heetei, Mana Gana Rago. Collects, Occasional Prayers, and Hymns. Norfolk Island: Melanesian Mission Press, 1907. A very limited translation of the 1662 BCP. Includes Daily (Morning & Evening) Prayer, Prayers, the Ten Commandments, and several hymns. Summer Hill, New South Wales: Melanesian Mission Press, 1945. E Rin Ei Ha’arahesi Nau Maea Ni Melanesia Ha’ate Ni Arosi, Hanuato’o. 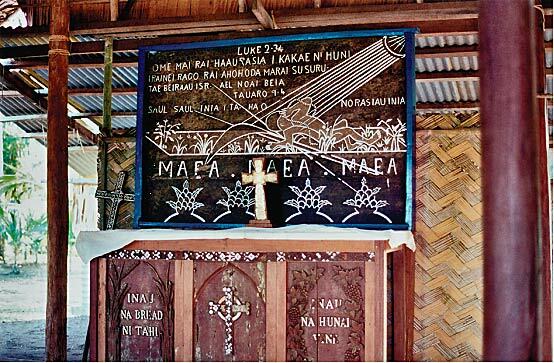 A Liturgy for Melanesia in Arosi. Thanks are due to Richard Mammana, who transcribed all three texts presented here; to Thomas Rae, who proivided the 1945 Arosi BCP; and to Dr. Michael W. Scott, who provided the 1910 and 1980 texts.